Although my mom is much, much better at the Brain Age brain training games than my webcomic would suggest, she’s an absolute wiz at Tetris and Bejeweled. Challenge her. I dare you. If you missed her first attempt at Brain Age, check it out here. Wow! Two in one week? And a birthday??? Rock it out!!! Nice job, as always! Love the strip! Had to laugh, but Jefbot is lucky that his mom’s sense of humor hasn’t deteriorated along w/her brain. 🙂 What dangerous event was his sister planning for his birthday? hahahaha. making fun of lil gram. good times. Do a strip about last night! Do a strip about last night. hahahaha! i’m so sick…, did we have fun or what! Hey Jeff! Sorry I haven’t checked in for a while. 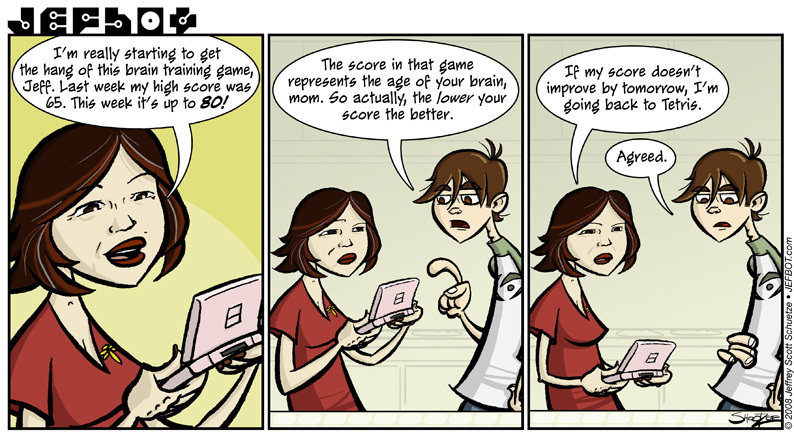 But lol on the comic, I’m playing Guitar Hero 3 with my friends and my fingers are gonna fall off! >,< I’ve been playing expert and hard!!!! Anyway Jeff, hope your doing well and see you whenever I guess. Ha ha. Your mom is dum-dum. michael cornacchia, JEFmom DOES rule! jeff payton, yes, i’d rather not know my own brain age, myself. heheh. partygirl, yes, we did! let’s do it again this coming weekend! lor, no, her character just plays dumb in the strip.